Students are starting to repopulate the campus and the relaxed pace of the summer is being quickly replaced by frenzied preparation for the start of the semester. This semester, I will be teaching the intro to microbiology course that I have taught every year. In the lab, we do some bioinformatics analysis of metagenomic data from a Winogradsky column. A Winogradsky column is a clear cylinder full of pond mud that is used as an enrichment culture to grow bacteria that cant be grown under normal laboratory conditions. To make a Winogradsky column, you collect mud from a pond or riverbank. (For those of us that are used to the cleanliness of working in a sterile hood, that means you have to take off your lab coat, get down on your hands and knees, and scoop up handfuls of goopy stinky slimy stuff from the the edge of a pond. I wear latex gloves.) You then add it to a plexiglass cylinder along with a source of cellulose (I use leaf litter) and additional sulfate to promote enrichment for microorganisms involved in the sulfur cycle. Over a period of months, layers of microorganisms requiring a range of environmental conditions develop in distinct niches with distinct populations participating in diverse metabolic activities. As various metabolites in the column are used, byproducts are produced, and the environment in the column changes. As a result of changing concentrations of oxygen, hydrogen sulfide, and variations in metabolites, different microbes will thrive and create their own niche. Although you can see some changes occurring in the first few days, it takes several weeks or months for it to develop so I always set it up before the semester starts. 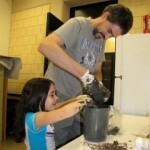 This year, I had the help of my daughter (age 5) who was eager to get her hands into the gooey muck. 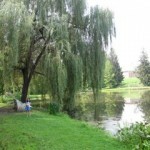 We took the mud from the edge of Vassar Lake, a pond on campus. In the pictures you can see the changes that take place over time. 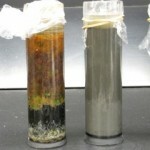 The column starts out as grey silt, while the column on the left is 1 year old. The patches of colours are the different communities of bacteria.